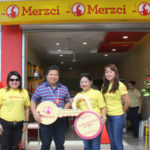 One of our family’s favorite snack is Merzci Pasalubong Butterscotch. My kids would always ask for this sweet, buttery, and filling treat (along with some tarts) whenever we get to pass by a Merczi Pasalubong outlet. It’s a snack bar that’s about 1″ x 1.5″ x 1″ in size. It’s chewy and moist on the inside and topped with crushed cashew. We always buy this snack for ourselves and also as Bacolod pasalubong for our friends and family in other places. 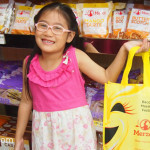 At Merzci Pasalubong, they have two packs available, the small pack that contains nine (9) pieces of individually wrapped butterscotch slices and the big pack of two dozens. Aside from bringing them as pasalubong, many people buy butterscotch and have them as snacks or as part of the dessert table during gatherings and parties. They are handy and convenient and since they are individually packed in sealed plastic wrappers, they are sanitary, too. 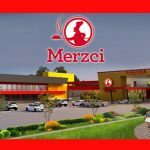 These are usually combined with others products of Merzci, like their kinds of tarts. 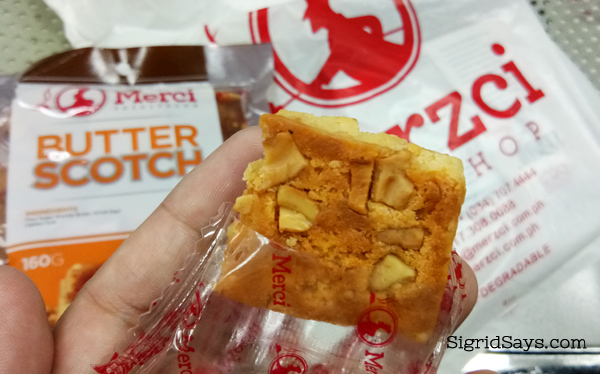 Our recently flight to Cebu was delayed and so we munched on Merzci Butterscotch to assuage the hunger pangs. Having butterscotch is actually kind of filling with each bite-size piece because it’s a flour-based product and not exactly the popular butterscotch that is a hard candy. But even with that, even as snacks or as dessert, it’s kinda hard to stop because it’s just so good. Aside from being such a presentable pasalubong item or gift, the butterscotch is great to bring to other places because it does not spoil easily, does not get crushed, and has a very long shelf life. But don’t ya worry, since this is a fast-moving item, you are that what you get at the outlets are made fresh. 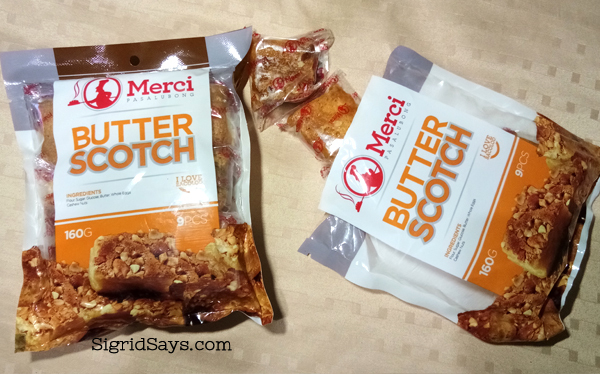 If you haven’t tried it yet, grab a pack of Merzci Pasalubong Butterscotch. Manamit gid (so delicious) and you will certainly ask for more. 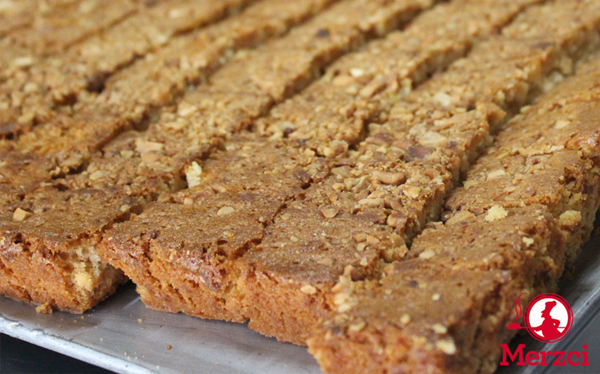 The butterscotch is baked in a big rectangular pan and sliced before packing individually. 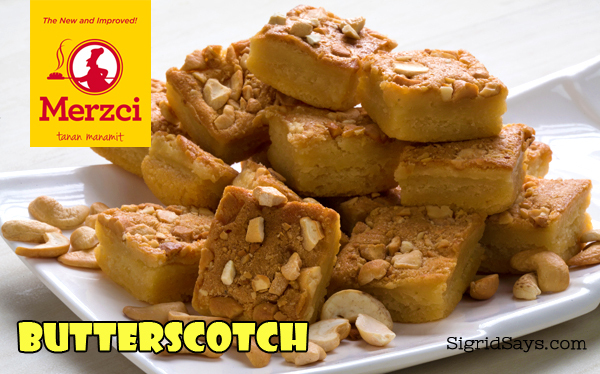 Small packs of Merzci Butterscotch have 9 pcs each.